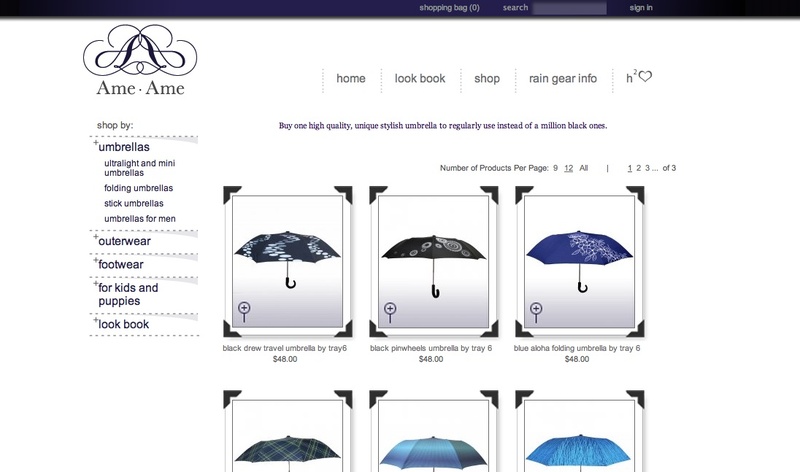 In Japanese, "Ame" means "rain" as well as "candy," and Ame Ame launched online at www.AmeRain.com because Ame Ame knows that it’s been hard to find attractive, quality raincoats, boots, and umbrellas. The client had a clear vision for how she wanted her shopping cart to function. Armed with a design from her favorite designer, we implemented the design to the pixel, and worked with the client to ensure a smooth shopping experience. Nice Menu Design: The left hand navigation had special details on it that we saw to fruition. 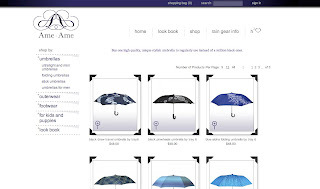 Look Book: An overlay was placed to link showcased items to their product pages for purchase. Design Treatment on Product Category Pages: The design called for picture corners and a faded bottom half of the product picture. We delivered. An outside designer, Tim Zeller, provided the website design.